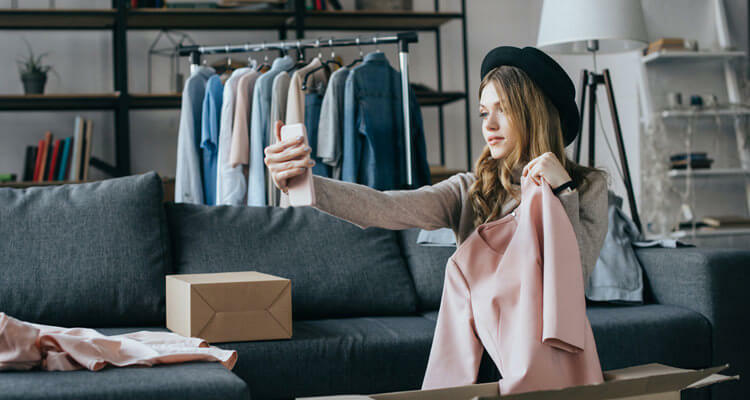 Ahh Instagram, whether you love it or hate it (if you're on this site, then you probably love it), there's no denying that it is the top social media platform for the fashion industry and its bloggers. Having klout on Instagram can help you attract more views to your blog, land collaborations with brands, and even get paid $15,000 for sitting on your couch. That's right, we've all read the various stories about the huge paydays popular bloggers get for their Instagram followings. This press leads to more followers for the blogger, which leads to more press, which leads to more followers…It's a social media snowball turned avalanche. This is obviously something small time bloggers like myself aspire to, but how do you start when you're essentially a snowflake on a mountain with multiple avalanches? It was just a few months ago that I decided I wanted to take my hobby, fashion blogging, to the next level and start to grow my audience. At the time I had about 250 followers on Instagram which consisted mostly of friends and family. After doing some research (and making my fair share of ‘what's on my table' collages) I've grown my account to have over 2,100 followers, more than 1,500 of which were acquired in the month of July. It took some testing and experimenting to figure out what works and what doesn't, so below I've compiled some of the things that work, and others that don't. Here's how to get noticed when there's no reason for anybody to notice you (yet). It is a social network after all! I got this idea after reading online that the easiest way to market your site for free is to try to interact with potential customers (aka followers) 100 times a day. When you apply this concept to Instagram, that means you should try liking, commenting, or following something or someone new 100 times every day. Hey, no one said this was easy. The key here is to not just go like or comment on a bunch of celebrities photos; they're famous and they don't have time to notice every single comment like normal users do. I chose to target people that follow my favorite inspirational accounts (can I be Tuula Vintage yet?) and also people that have recently posted a photo with the same hashtags as my most recent posts. Don't be shy! If their account is public, chances are they secretly want more likes, comments and followers just like you, so find users you like, support their efforts, and they may support you right back! Instagram users are most active when you would expect them to be; before work/school, during their lunch break, right after work, and right before bed are all spikes in activity. These are great times of the day to work on your interactions and post photos! If you want more eyes to immediately be on your posts, ‘gramming during these times of the day is helpful. Also make sure you're not posting too much or too little! You don't want any of your followers saying “who is this?” after a two week hiatus, just like you don't want them saying the same thing in an annoyed tone after you post your fifth picture of the hour. Full time bloggers tend to post 3-4 times a day, but I try to post around once every day or so, and never two less than 2-3 hours apart. This should go without saying, but when people take a look at your profile, your most recent photos are what is going to sell them on whether or not to follow you. I can honestly say that I have noticed both spikes and drops in how many followers I get in a day based on whether my most recent photos are eye catching. I'll also add, that even though I love a good shot of shoes, brunch or hydrangeas (seriously, when did they get to be such a thing? ), my followers are clearly more interested in photos of me. It kind of pains me to say it, but four out of the top five most liked photos on my profile are photos of me, and three of them are selfies. As someone who enjoys curating an image, simply taking a selfie doesn't feel like much of an artistic outlet, so I try to keep them to a minimum and I've been trying to get in the habit of posting more OOTD photos of me (I am trying to be a fashion blogger after all). Whether you choose to post them or not, just know that people have a stronger reaction to photos of other people than to the tomato food gradient you put together before eating your salad. And that's it. Keep at it and watch your numbers rise. And don't get discouraged! Getting noticed is hard work. When I first started I was lucky to get 10 new followers in a day, but after a few weeks at my peak I was getting up to 100 new followers a day. You'll notice that I didn't say much about hashtags, and that's because so far I've seen that hashtags can help you get more likes, but not really that many followers. Maybe that changes once you start to snowball…only time will tell. Want to contribute a guest post to IFB? Learn how here. Becky Freeman lives and works in Rhode Island in the biotech industry and uses her blog, Fashion Food Fotos, to escape the 9-5 and express her love of fashion, food, travel, and design. When she's not at the office you can find her touching cashmere at Barneys New York, eating cheese, and day dreaming about the perfect bar cart. I’ve been surprised by how well my selfies do as well, but I think readers like to see the “real” person behind the blog, not just out styled outfit photos. This is a great piece. I shy away from Instagram because I don’t want to annoy what little followers I have and I can be self-conscious but I’m really… really trying to put myself out there more. Can’t grow a following without having something to follow, right? Fantastic tips! 🙂 I think you definitely nailed it with the importance of interaction. Befriending other fellow bloggers on IG is such a great way to form new friendships and build your following at the same time! It’s such a shame when I come upon amazing IG accounts but because they rarely interact, they don’t have the amount of exposure they deserve. This is a fantastic posts and really helpful. It is so nice where bloggers share tips with one another that really work. Thanks for the advice Becky! Thanks for sharing what works for you. I have been having the hardest time building my audience, and your suggestions gave me great insights. Interacting with 100 followers a day sounds like a lot, but if you want anything, you’ve got to step up and do the work! I guess I’d better get busy! It helps to get into a routine and identify time when it’s not a big deal to be glued to your phone for a few minutes. I’ll work on interactions while I eat breakfast or while my dinner is cooking, that way social media isn’t disrupting my day! Hi ! I just read your post, thanks for sharing your tips. This is great! I feel like a lot of people with a solid fan-base make it sound as if 5,000 followers just fell into their lap one day. Thanks for the real tips! Thanks for the tips! Like some of the other commenters, I too have trouble building my audience. I will try to be more active on Instagram. My progress was slow-going at first too… I think that the eventual boost in followers was because I experimented quite a bit with my interactions and eventually found who my potential audience was, where I could find them, what they were posting about, etc. They aren’t always users who are doing the exact same thing as you, so don’t get discouraged! You’ll find them! Instagram has definitely helped my blog but these are great tips to try! Fantastic post! I haven’t started on IG yet, but this article is definitely motivating me to join! Loved the post. I am quite new on Instagram and trying to build on a following. I will try these tips. Thanks so much for sharing. Being involved in giveaways has also helped me. For over a year I’d steer clear of them because they seemed like another way of “buying” followers. However, participating in giveaways that involve items and other IGers who go seamlessly with the voice of your page is a lot more authentic. Sure some will unfollow after the winner is announced, but a lot of others will stick around forever. It’s a great way to get in front of those who may not find you otherwise and build your tribe! Awesome tips! I have been doing a few of these for the past few weeks and have noticed an uptick in followers. The one thing that I always forget to do is be social, that can be so time consuming but is for sure the best way to grow. “The key here is to not just go like or comment on a bunch of celebrities photos; they’re famous and they don’t have time to notice every single comment like normal users do” True, in every social network, I always follow or like the common person like me whom in all likelihood will reciprocate my good gesture. We can start by all following each other! Great tips 🙂 I’m really trying to promote both my blog and Instagram. Definitely agree with good timing of posts; this seems to be working fairly well for me! For under a thousand dollars, I got far more than I paid for and would highly recommend her as she’s also worked with a number of New York Times best-selling authors in the past. While I have yet to determine the long-term financial results of this particular project, it is my strong belief that keeping one’s work to a high standard always pays dividends in the long run. The struggle! I learn everyday from the posts i make, there’s nothing worse than seeing the numbers go down, that really upsets me, but it’s not always like that, sometimes I have great days, but sometimes there’s brands or people who follow you so you follow back, and when they find out you dont, they unfollow, it’s like you’re forced to follow people to keep them happy, at least at the beggining, i dont like that. Thanks for the wonderful tips! I have been trying hard to increase my IG followers and interaction with fellow instagrammers with similar interest has definitely helped me grow my follower base a lot! Instagram is something that I definitely find important, as it is basically an extension of your blog! I have just launched my blog and am currently working on combining my personal Instagram with blog features while still maintaining the followers I already have, as well as hoping to gain new followers! Thanks for posting this article. I launched my fashion and beauty blog back in August and my husband is always wondering why I am on my I Phone (ha)! It is a constant thing- trying to get followers, but hopefully it will be well worth it. I am already enjoying connecting with new followers over Instagram and through my Blog comments. Hustle Hustle !!!! Great article. Another thing you can do is to host a contest/giveaway. Post a photo of the prize and ask users to tag 5 of their friends in the comments section to enter the draw. I managed to get over 1000 new followers from just holding 1 giveaway. I agree, Becky. Great post! I also suggest you guys to try a planning/scheduling app for IG. I do use PLANN and it’s just awesome that suddenly I got more likes and followers!